Joseph Beutel, Cassandra Zoe Velasco, Jarrett Ott and Jenna Siladie in Alexander bis. Photo by Richard Termine. BOTTOM LINE: A double bill of short, comedic operas with visual and audio appeal that triumph in style as much as they triumph in humor. In the mood to be tickled pink? How about being tickled in black and white? 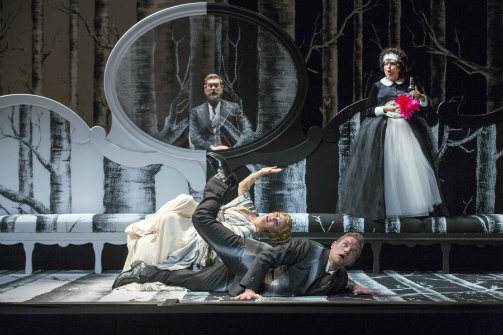 Gotham Chamber Opera’s production of Alexandre bis & Comedy on the Bridge may fit the double bill. Designed whimsically and stylishly in a black and white color scheme by Cameron Anderson, the show’s lavish set not only reminds you of Cruella de Vil but also underlines the thematic duel between good and evil. It also creates the tone for this double-feature opera to start delighting even before anyone utters a word. But when someone does, that’s when the real fun begins! Set in a bourgeois Paris salon and sung in French, the U.S. premiere of the farce Alexandre bis, (translated to Alexander Twice or Alexander Again in English), an opera written in response to Mozart’s Cosi fan tutte, shimmies in with the character Philomene (Cassandra Zoe Velasco), the maid to Alexandre 1 (Joseph Beutel) and his saintly wife Armande (Jenna Siladie). Philomene and a Portrait of Alexandre (yes, a portrait of Alexandre), also played by Beutel, serve as the commentators of the nutty goings-on. Perhaps out of boredom and definitely out of mischief, Alexandre decides to test his wife’s faithfulness by shaving off his beard and pretending to be his cousin from Texas, played by Jarrett Ott as Alexandre 2. Confused yet? Of course you are. Although Armande is trustworthy and has been proving her fidelity for years against people like the oversexed Oscar (Jason Slayden), she falls in love with her husband’s American “cousin” despite and with her knowledge of his true identity. As the web of deceit spreads and entangles everyone in ridiculous hijinks, it’s imperative that you are able to suspend your disbelief, but if you can manage to give in to the outlandishness, a good time is bound to ensue. Stripping away some layers of buffoonery and interior design but not receding in quality, the night continues with the often-performed Comedy on the Bridge, an adaptation of a play by Vaclav Kliment Klicpera. Comedy on the Bridge, originally a situation comedy produced for radio audiences, sings the tale of people who are caught between a bridge and some hard men. In the midst of a war where the opposing forces are separated by a great river and a bridge with sentries on both sides, Popelka (Jenna Siladie) tries to make her way through enemy territory to get home, and is given a pass by the Enemy Sentry (Christiaan Smith-Kotlarek). Unfortunately, the Friendly Sentry (Aaron Sorenson) halts her on the bridge. When she tries to go back from whence she came, she is denied passage, making her journey a one-way only ordeal. Stuck on the bridge and unable to get back to her fiancé Sykos (Jarrett Ott), local farmer Bedron (Joseph Beutel) comes along, and flirts with Popelka despite having a wife at home. Soon, he too is stuck on the bridge with no hope of rescue. As the opera progresses, the bridge amasses a collection of distrusting significant others and local neighbors, with almost each person harboring some kind of secret that gets divulged quickly because, well, there’s nowhere to go and nothing to do but rant and reveal their true natures. Although Alexandre bis and Comedy on the Bridge differ in style and content, they are linked together by the ability to make us laugh and resist thinking, for too much reasoning would certainly spoil your sensory fun. Director James Marvel does a fine job of making full use of the modest stage and his talented physical actors amplify your theatrical experience even if the levels of the orchestra and voice projection of the cast during Alexandre bis are wanting. Although the intimate space of the Gerald W. Lynch Theater is not always filled with sound, the venue gives the wonderful effect of being in a comedy club with English subtitles displayed on the “ceiling” of the stage. Lighting designer Clifton Taylor provides beautiful, transcendent lighting to match the moods and time of day happening onstage. His expert use of shade puts the actors in the correct light every time, and play up the diversity in Fabio Toblini’s costumes. Whether high-class or fool, Toblini’s costumes hit the mark. Of particular note is one of his costumes for Oscar. At one point, Oscar comes in bedecked in a moth-like costume reminiscent of Arthur’s garb from The Tick. It’s hilarious to see even if you don’t know the comic or the several TV series that sprang from it. Though demonstrating his cleverness in both short operas, composer and librettist Bohuslav Martinu’s work shines through most clearly in Comedy on the Bridge because of his focus on language and dialogue. Though more tangible in plot and possibly construed as safer, the singing and music is louder and bolder in the latter show, and draws more attention. While the book was written by Andre Wurmser for Alexandre bis instead of Martinu, there are some wonderful undulations and punctuations in Martinu’s music in the opening show that complement the craziness of the plot twists. Whether you prefer Alexandre bis or Comedy on the Bridge will most likely be a matter of taste and if you are a knee-slapper when you laugh or prefer to titter. Whatever your preference, the thoughtful staging and performances make Alexandre bis & Comedy on the Bridge well worth seeing and admiring.